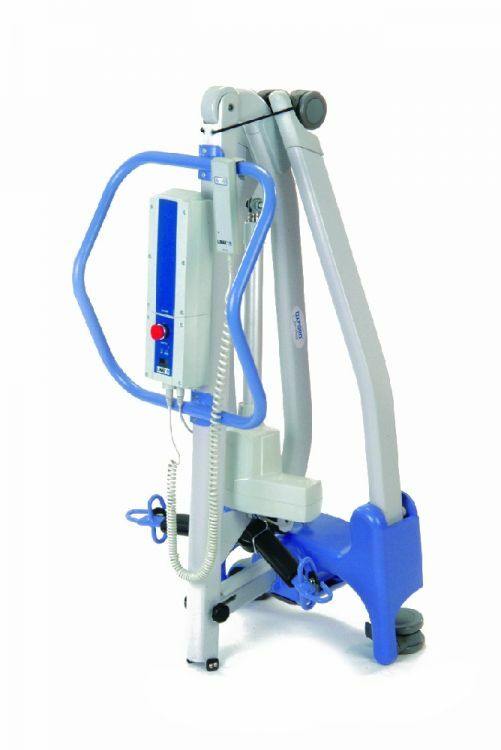 Oxford Advance Compact Folding Electric Hoist. The Advance Hoist is a compact fold-away hoist yet it is able to perform a wide range of transfers. Whether from the floor, on to a bed, or wheelchair to commode chair, the Advance copes with ease. The Advance Hoist's unique 'swan neck' leg design allows the hoist to get even closer to wide obstacles.This is especially usefull when encountering large chairs,bulky commodes and wheelchairs. The Advance Hoist needs no tools or special attachments to achieve its compact folded position and can even be dismantled very easily. This functionality gives active users the option to travel outside the confines of their own home. Bringing a new dimension to mobile patient handling equipment. The Advance Hoist is most useful where space and storage are at a premium. It is especially useful in home settings and nursing institutions where space is not always available. 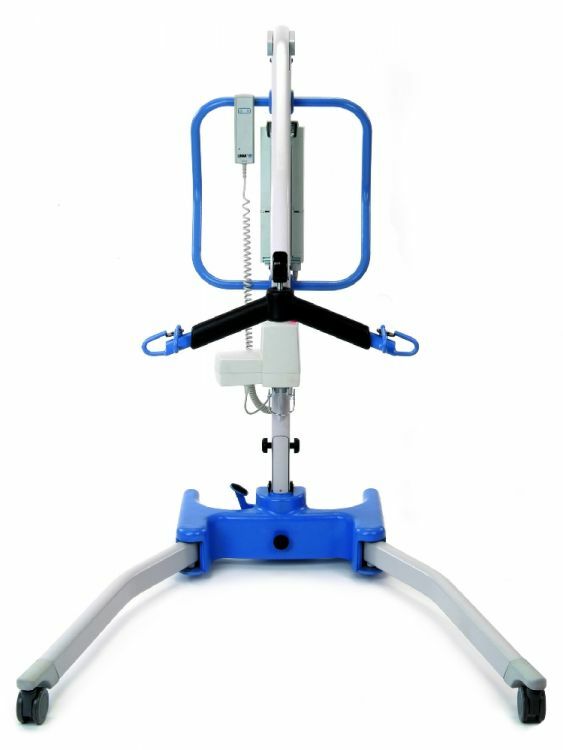 A push foot-pad has been incorporated into the design to reduce the force needed to initiate movement when manoeuvring the stationary hoist in a forward direction. 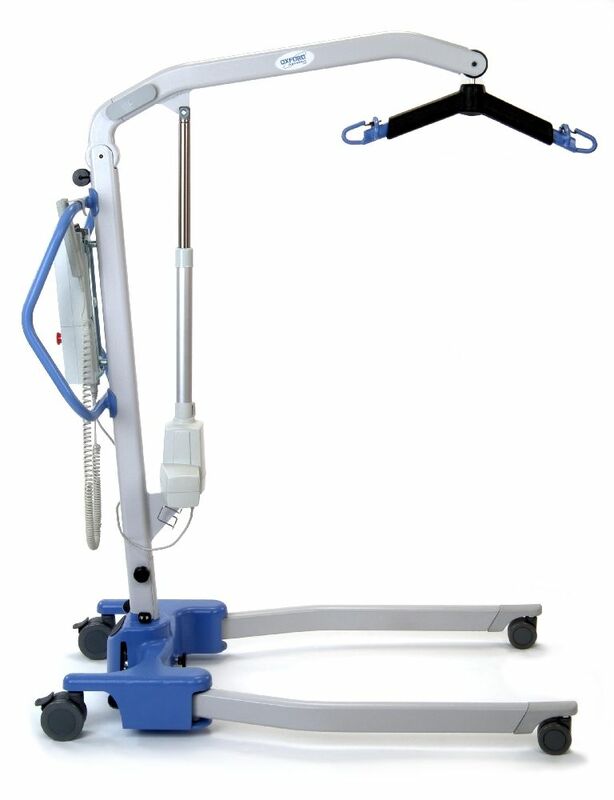 The over-sized handle provides a large surface area from which the carer can position the hoist before use. The triangular folded design enables the hoist to stand upright and unaided when being stored or transported. The Advance Hoist comes complete with a 6 point spreader bar. 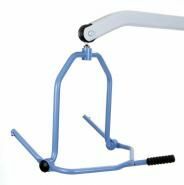 A 4 point positioning cradle is also available as an additional accessory which is interchangable with the spreader bar.